In 2014, we evaluated how effectively federal departments complied with the Plain Writing Act of 2010. 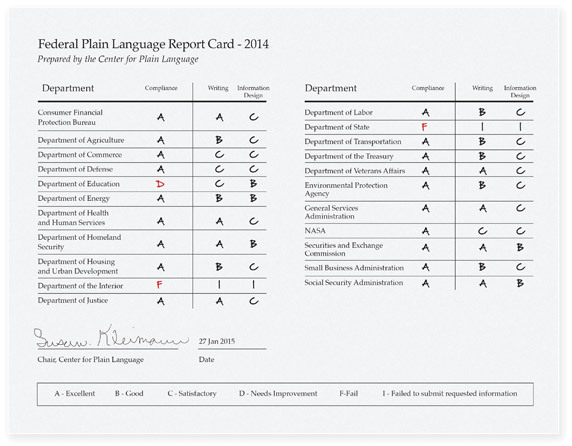 Our reviewers scored submissions using our criteria for plain language. We also used Acrolinx, an electronic text analysis tool, to review samples. Acrolinx provides a statistical analysis of grammar and style trends, and a “readability” score for each writing sample. Compliance — We determined whether agencies fulfilled the requirements of the Plain Language Act of 2010. Writing — We reviewed their writing samples to determine if they were easy-to-read, understand, and use. Did the writer limit their use of passive and hidden verbs? Did the writer use common words and avoid or define jargon? Was the content direct and concise or wordy? Was spelling, grammar, style and terminology correct? Information design — We reviewed the department used information design to guide readers’ attention and reinforce key messages. The designer chose pictures, charts, or graphics that reinforced and/or extended the written content. Or whether images added “visual interest.” If there were no images or graphics, would adding them help the reader understand? Download and review the complete 2014 Report Card. Departments with a B or higher received a commendation letter from Congressman Dave Loebsack. Interested in whether your agency would make the grade? Contact us and we’ll let you know what you need to do. Wondering who is working on plain language in the federal government? See our list of Federal Plain Language Websites and Senior Officials.